Just when we think we have a handle on what's going to happen with Minnesota Vikings, they prove us wrong. They were going to be a Super Bowl contender this year, but then they lost Teddy Bridgewater, so they traded for Sam Bradford. Then they were going to struggle without Adrian Peterson, but they kept winning and started the season 5-0. Once it was abundantly clear this team could overcome any obstacles placed in its way, the Vikings promptly collapsed -- they've lost five of their six games since the bye, and after losing in heartbreaking fashion to the Lions on Thursday, they now have a 56.6 percent chance of making the postseason. A 5-0 lock has turned into a 6-5 coin flip. The Vikings' loss Thursday came after a backbreaking interception from Bradford, who has mostly avoided picks this season. It was only his third interception of the year, but it came in a game where his defense had held the Lions to 13 points with Bradford doing little to hold the lead or add to the offensive ledger. He finished the game 31-for-37, but those throws generated just 224 yards, with 119 of those yards -- more than 50 percent -- coming after the catch. His average pass traveled just 3.4 yards in the air on Thursday, which is the second-lowest average distance for a starting quarterback in a single game all season. Coincidentally, the guy in first was Bradford's opposite number on Thanksgiving, Matthew Stafford, who averaged a scarcely believable 2.8 air yards per pass in Week 5 against the Eagles. There's a difference between the two: Stafford was being pressured on nearly 40 percent of his dropbacks in that game and posted a 65.7 QBR. Bradford was pressured on only 5.4 percent of his dropbacks Thursday, the second-lowest pressure rate for any passer in a single game all season. He managed only a 30.7 QBR. Bradford gets a ton of help from his defense and precious little assistance from certain parts of his offense. He was missing Stefon Diggs, and the Vikings just changed offensive coordinators a few weeks ago, but that also was in part because Bradford had more of a rapport with his former Eagles offensive coordinator, Pat Shurmur, than departed OC Norv Turner. There is, well, there's a lot to unpack. How has Bradford performed versus expectations? He wasn't impressive on Thursday, but I think it's fair to say Bradford has played the best football of his career or come very close this season. Take a look at the chart. Bradford has become a further-realized version of himself. He has looked into the mirror, liked what he saw, and doubled down on Sam Bradfordness. He's throwing shorter passes than ever before -- likely called with a leaky O-line in mind -- averaging a league-low 5.9 air yards per attempt, but completing those throws at an extremely high rate and avoiding interceptions almost entirely. Bradford has been a caricature of a game manager. You can be a useful NFL quarterback with this sort of profile, with Alex Smith as the most obvious example, but the margin for error is extremely thin. Smith made one bad read and threw an interception in the end zone last week and it cost the Chiefs the game; Thursday, Bradford made his own mistake on third down in the final minute and it handed Detroit a come-from-behind victory. The former first overall pick also deserves credit for adjusting to his new environs so quickly. Bradford was acquired just days before the season and stepped into the lineup for a critical NFC North matchup against the Packers in Week 2 to deliver what might have been his best game of the season. I know I certainly expected Bradford to struggle at first, given the complexity of NFL playbooks and the time it takes to develop a level of chemistry and familiarity with a new offense. It would have been fair to argue against the Bradford trade under the logic that it would take him a few weeks to settle in, which would have crushed the value of the trade as a way of keeping Minnesota's playoff hopes alive for 2016. Bradford proved that argument wrong. 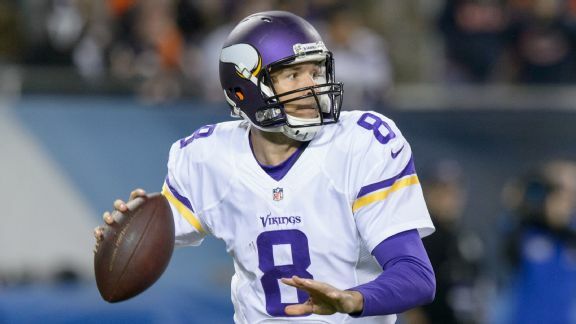 Are the Vikings better with Bradford than we could have expected? They are about where we could have expected they would have ended up after 11 games, but the shape of that performance is wildly different from what we might have believed. The defense, which was good last year, has taken an enormous leap forward. The Vikings were fifth in points allowed last season but just 14th in defensive DVOA, owing to the way their offense ground out games and extended drives. Minnesota faced the fourth-fewest drives and defended the fifth-longest average fields in the league. This year, the Vikings' defense has improved dramatically. The Vikings were sixth in DVOA heading into the Lions game, which is still below their second-place rank in points allowed per game, but the gap is much smaller. They've chipped in with three defensive touchdowns, while their return units have added three scores on punt and kick returns. Minnesota's returners have been worth 17.1 points of field position this year through Week 11, second in the league behind the efforts of the Philadelphia Eagles. Of course, their special teams haven't been perfect, mostly owing to a bad start for Blair Walsh, and while their running game was effective last season with Peterson, the performance with Peterson injured and an offensive line riddled with injuries has been historically awful. How bad? They narrowly avoid being called the worst rushing attack through 11 games since the AFL-NFL merger in 1970. The Vikings have run the ball 275 times for 782 yards this season, an average of 2.84 yards per carry. The worst post-merger rushing attack through 11 games, that of the 1971 Houston Oilers, averaged 2.82 yards per rush. The offensive line woes are obviously also influencing the ways in which the Vikings use Bradford. Even if they wanted to ask him to throw the ball downfield to Diggs and Cordarrelle Patterson, there's no way the offensive line would be able to hold up long enough to give Bradford the time to make those throws. Minnesota had what appeared to be a deep offensive line heading into the season, but that depth quickly disappeared. Former starters John Sullivan and Phil Loadholt failed to recover from injuries which cost them their 2015 seasons, and neither made it to the active roster. Starting tackles Matt Kalil and Andre Smith were both done for the season with their own injuries by Week 4. On Thursday, the Vikings lost two more linemen during the game, as center Joe Berger suffered a concussion before right tackle Jeremiah Sirles went down with a hip injury. Berger was the only lineman on the team to play even 90 percent of the offensive snaps before Thursday. Do the injuries invalidate criticism of the Bradford trade? The original argument back when the Vikings traded two draft picks for Bradford was they had a Super Bowl-caliber team built around a 31-year-old running back. Trading for Bradford kept their window open; failing to acquire him would have shut the door on any championship aspirations the Vikings had for 2016. The hole in that argument is what we've seen happen this season. It assumes that everything else for the Vikings is going to go right; namely, that the team would avoid the sort of injuries that could sink even the sturdiest NFL battleship. That belief was likely misguided. Nobody could have predicted Peterson would miss almost the entire season, but he was a 31-year-old back with nearly 2,400 carries on his tires with a history of injury issues. Even ignoring the child abuse case that cost him his 2014 season, Peterson has made it through only two 16-game seasons in the past five years. He was always likely to miss a few games, which erodes the logic of the trade a bit. The offensive line rotation included five veterans who have required a trip to injured reserve over the past two seasons, and that doesn't include Kalil (whose play has deteriorated while limping through injuries) and fill-in Jake Long (whose career was decimated by injuries and who suffered an Achilles injury after four games). Research I've done suggests that injuries are mostly random, especially for younger players. Health one year shouldn't make us just assume health the next. But based on this, if anything, it's a surprise the Vikings haven't been hit by an injury to Bradford himself. Despite the offensive line woes, their quarterback is on pace for his first injury-free season since his 2012 campaign with the Rams, having missed 27 of the next 48 games in the three ensuing years. The possibility of a Bradford injury was another one of the arguments against the deal that is somewhat forgotten now. He has managed to stay healthy, but the injury chaos surrounding Bradford is a reminder of how we can't assume everything will go right in justifying win-now deals. Has Bradford made a difference in terms of winning games? Let's look. The Vikings were supposed to be built around a great defense and a Peterson-led running game, but only one end of that bargain has held up. Minnesota wasn't acquiring Bradford to be Drew Brees, but you don't give up a first-round pick unless you think you have a guy who can squeeze out a late score to win a game. Where has he made the difference so far this season? You can make a case for Week 2, Bradford's debut, when he threw a 25-yard touchdown pass to Diggs to put the Vikings up 17-7 on the Packers with 2:11 left in the third quarter. The Packers scored a touchdown in the fourth to get within three, but never got much closer. Bradford didn't do much to close it out in the fourth: He completed a 15-yard pass on third-and-27, had a pass batted away, took a sack, and was part of a 12-yard pass interference call. He otherwise kneeled, handed off, and threw a pass with three seconds left to burn the remainder of the clock. The three other games in Minnesota's winning streak were all by double digits; Bradford played well, but his defense allowed an average of 11 points in those games. Minnesota's only other victory came against the Cardinals in Week 11, 30-24, in a game where the Vikes scored 14 points on returns and Bradford's only second-half scoring drive produced a field goal. In the fourth quarter, Bradford's offense produced one first down, while he took a strip sack that gave the Cardinals a short field and set them up for a touchdown. Bradford's most impactful fourth quarter came against the Lions in their first encounter, when he drove a trailing Vikings team into the red zone twice and had them positioned to win. Matthew Stafford and the Miracles had another tune in mind. It's possible that Shaun Hill might have thrown a game away with some sort of awful three-interception performance, but given how little the Vikings are asking Bradford to do, it's also difficult to imagine Hill would been in a position to make those sorts of mistakes. Bradford has played well in games where the Vikings were blowing out the competition, which isn't a knock on him as a player. It's not Bradford's fault his defense blew that lead the first time around against Detroit. Given the outcomes of this specific season, though, you have to really squint to make a case for Bradford pulling out any games the Vikings wouldn't have otherwise won with their defense. Does Bradford make the Vikings better in 2017? He might, either as a quarterback or as a trade asset, although the latter seems murkier as an argument. Bradford is signed to a one-year, $17-million deal for next season, which serves as both a friendlier franchise tag (just $4 million of his deal is guaranteed) and leverage to negotiate a long-term contract. Bradford infamously is rumored to have turned down an extension from the Eagles before the 2015 season in light of his fantastic preseason and what it portended for the future; he may be more amenable to a long-term deal this time around. The trade market is beginning to look a little cloudy. Bradford is not playing as well as he was after five games, and that shiny 5-0 cachet has faded. It's also beginning to look like a buyer's market for quarterbacks, with all kinds of makes and models available. Tony Romo?is going to be traded or cut. Jimmy Garoppolo?probably will be dealt. Jay Cutler?is going to be released. Colin Kaepernick, showing signs of life in San Francisco, will likely hit the market. Teams such as Miami and Washington, who might have wanted to go after a new quarterback, seem likely to hold onto their starters for the foreseeable future. The market looks to be six teams, and of those six, the 49ers and Browns are extremely unlikely to trade away draft picks for a starter on a one-year deal. The Bears might be desperate enough to make that move, but otherwise, you're left with the Jets, Cardinals and Broncos picking and choosing their quarterback option, and the Jets have serious cap concerns. If the Vikings can get a second-round pick for the final season of Bradford's deal, it would help matters. Bradford has played better than Bridgewater did in 2015, especially given the injuries around him, but he costs nearly eight times as much on the cap. If Bridgewater is healthy (a major question mark), the Vikings are surely better off with Bridgewater and $15 million to spend on their offensive line than they are with Bradford. If Bridgewater isn't able to play, the Vikings could almost definitely acquire Romo for 2017 for far less than a first-round pick, with Romo promising a much higher ceiling than Bradford, albeit with a similarly scary injury history at an older age. The package they used to spring Bradford probably will end up as enough to get Garoppolo next year, too. The Vikings couldn't have foreseen Dak Prescott's emergence in Dallas making Romo available, but the unique attrition rate and rapid player value fluctuation in the NFL has to be accounted for when you make win-now, pay-later trades. The landscape can change dramatically in a year. So ... was it a regrettable trade? Contrast the situation in Minnesota with Denver. We could have made the same arguments for the Broncos, who were built around a dominant defense with players such as? Von Miller and Aqib Talib in the prime of their careers. It's true they just won a Super Bowl, but that fact shouldn't influence their future decision-making; just as the Vikings would have been wasting a year of Peterson's prime, the Broncos didn't pay a premium for somebody like Bradford and chose to risk wasting a year of their defense's prime. Things haven't gone poorly. In a tougher division, the Broncos are 7-3. Their running game has been disappointing (albeit not historically bad like Minnesota's), and the play they've gotten out of Trevor Siemian and Paxton Lynch hasn't been remarkable, but their defense has played at a high enough level to push them toward a likely playoff berth. Now, having sacrificed only a third-round pick to move up for Lynch, they have both the cap flexibility to absorb a contract like Romo's and the draft picks to help build a better team around Lynch if they choose to go with him. At least if they want to. The Vikings normally think like the Broncos. They retain flexibility, build through their draft picks, and think about the long-term picture more than most other teams. They made what even they would characterize as a desperate move to salvage their season after the heartbreaking injury suffered by Bridgewater. Their decision has always been defensible. When they made the trade, though, it was not to acquire an average-to-below-average starting quarterback. Bradford, even in this best of seasons, is 24th in QBR and 16th in adjusted net yards per attempt, which incorporates sacks and weighs interceptions better than passer rating. It was designed to acquire a quarterback who would be good enough for the Vikings to stay on their Super Bowl track. Bradford hasn't been the central problem, but after their loss Thursday, FPI suggests the Vikings have a 5.3 percent chance of making the Super Bowl. The Vikings got the quarterback they were hoping for and he hasn't really made a difference anyway. That alone is probably a sign that their logic in making the initial trade doesn't really stand up to scrutiny.